Click here to view last year cover featuring Elizabeth Banks, here to view 2014 cover featuring Amber Valetta, here to view 2013 cover featuring Zoe Saldana, here to view 2012 cover featuring Elizabeth Banks, here for 2011 cover with January Jones, here for 2010 cover with Megan Fox, and here for 2009 cover with Jessica Biel. Click here to view last year cover featuring Lorde, here to view 2013 cover featuring Isla Fisher, here to view 2012 cover featuring Kristen Bell, here for 2011 cover with Daria Werbowy, and here for 2010 cover with Cindy Crawford. Click here to view last year covers featuring Christy Turlington, Soo Joo Park, Helena Christensen, Emilia Clarke, Stacy Martin and Julianne Moore. Click here to view 2013 covers featuring Eva Herzigova, Irina Shayk, Anne Vyalitsyna, January Jones, and Kate Bosworth. Click here to view 2012 covers with Elizabeth Olsen and Shailene Woodley, Academy Award nominated actress Julianne Moore, and top models Rosie Huntington-Whiteley (snapped by Greg Williams), Helena Christensen and Erin Wasson. Click here to view last year and 2010 covers featuring Kylie Minogue, Nanna Øland Fabricius, Paris Hilton, Sky Ferreira, Claudia Schiffer, Vanessa Paradis, Bar Refaeli and Claire Danes. December is not even started but here we are, presenting our first 2014 covers recap already! As usual, Numéro Tokyo is the first magazine to wrapped up their front pages line up for this year. They started the year with a soft palette cover and styling of this year’s IT model, Cara Delevingne. Valerija Kelava, with a blunt bangs, fronted the magazine’s March issue shot by Sofia Sanchez and Mauro Mongiello who shot the most covers this year. Another cover model with blunt bangs hairstyle was Vlada Roslyakova on the April issue by Ellen Von Unwerth. Continuing their tradition of having studio shoots, Numéro Tokyo photographed most of their covers with plain backdrop in various colors. From Kiko Mizuhara beauty shot, flower girl Meghan Collison, to classic faced Julia Frauche, cool veteran catwalker Maggie Rizer to model turned actress Tao Okamoto. The only time they have outdoor shots were the one with Elizabeth Olsen (by Michael Schwartz) and Lindsey Wixson (by Guy Aroch)—our favourite image of the year from them. Share your favourite covers in the comment box below. 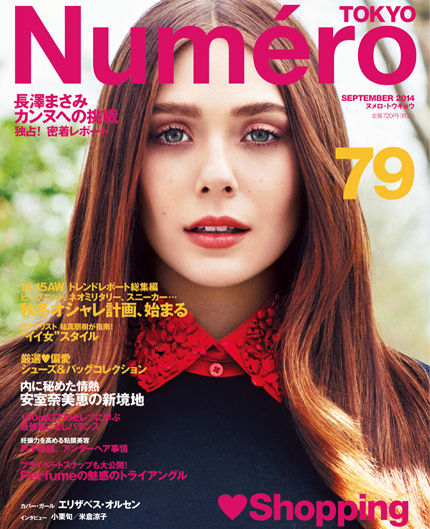 Click the links to read 2013, 2012, 2011 and 2010 recaps from Numéro Tokyo. Click here to view last year cover featuring Rosie Huntington-Whiteley, here to view 2012 cover featuring Candice Swanepoel, here to view 2011 cover featuring Guinevere Van Seenus, here for 2010 cover with Kasia Struss and here for 2009 cover with Eva Herzigova.